Trattoria Mimmi is probably the oldest restaurant in the Niccone Valley. 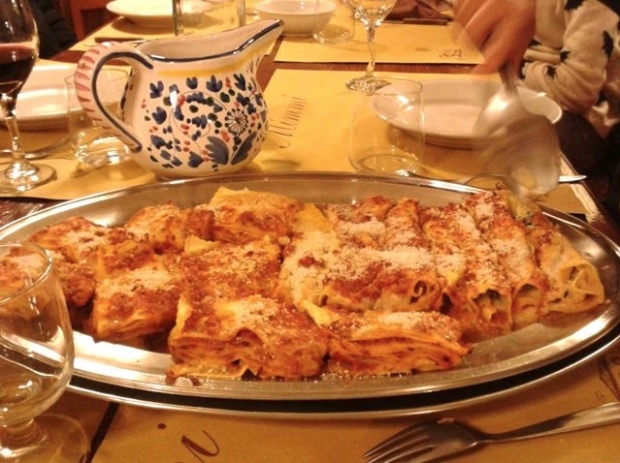 Located in the village of Mercatale di Cortona, it is famous for the huge servings of delicious home made pasta. 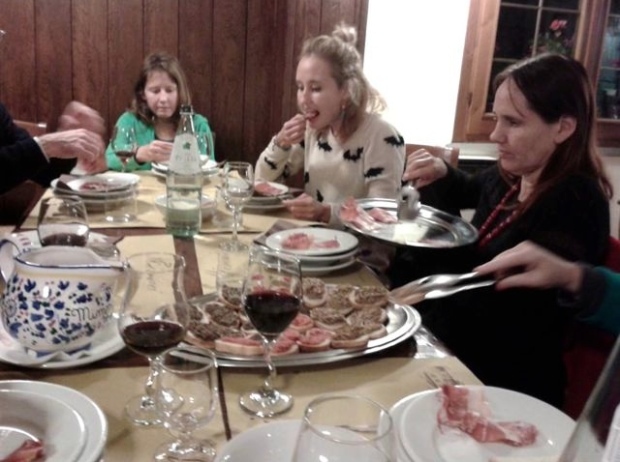 The menu is simple, you are asked if you would like antipasto, (a mixed platter of crostini, meats and cheeses), offered a choice of three pasta dishes and then, if you can manage it, asked if you would like the meat course. 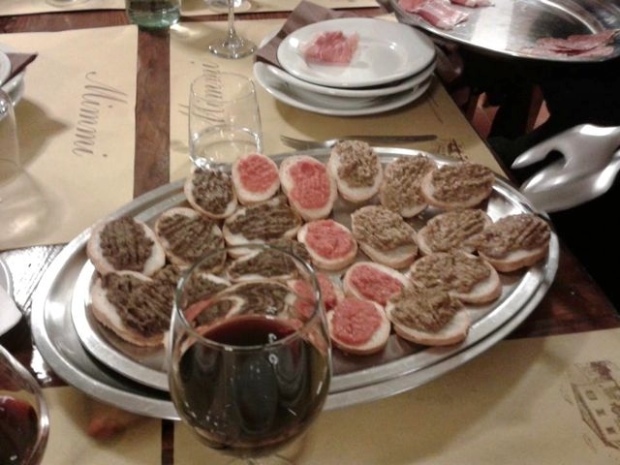 Crostini, part of the antipasto at Trattoria Mimmi. Water and house wine have always been included in the bill although bottled wine is also available. 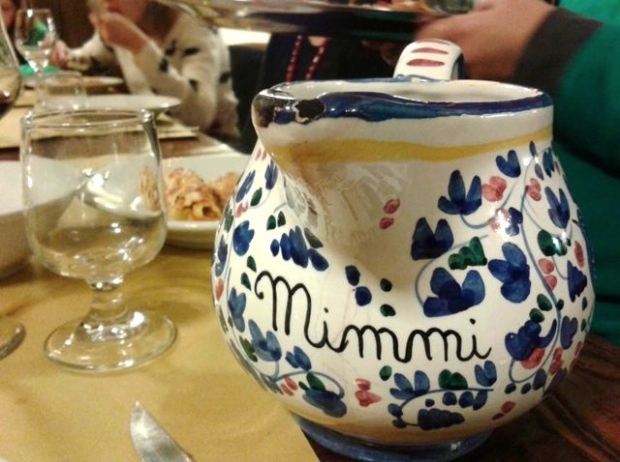 The house wine is serves in maiolica jugs with long spouts that, no matter how hard you try, always manage to dribble some wine on the place mat! We went to Trattoria Mimmi around a month ago to celebrate the end of our Olive Harvest with some friends who had come over to help out. Everyone started out feeling very hungry, we all ordered the antipasto and shared a selection of all three pastas on offer (mushroom tagliatelli, lasagna and cannelloni). However, by the time we got to the meat course the majority dropped out – only three out of a group of eight felt able to continue. This was a shame as the meat was delicious, the pieces of sliced steak (tagliata) were melt in mouth. Naturally, some people’s appetite began to recover for the dessert, traditionally there was only Mimmi’s tiramissu but nowadays there is a choice, I think panna cotta and creme brulé were on offer, but I’m not the person to ask, I passed on this course and my camera memory (like me) was full. The meal cost €200 or €25 a head, quite reasonable when you consider the quantity and quality of the food!